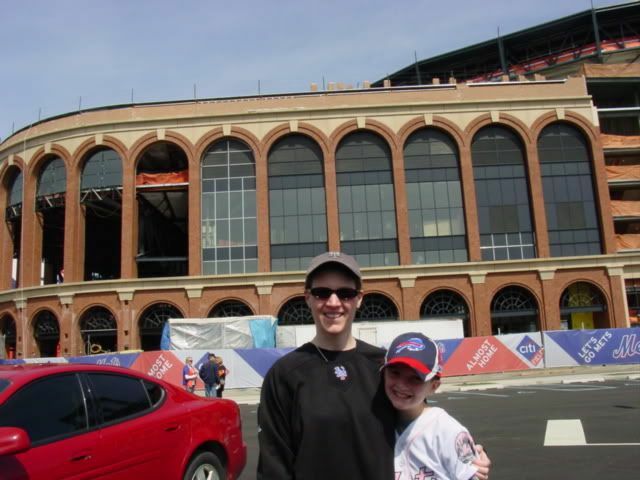 For Mother's Day 2008, Jill's one and only request was to go to a New York Mets game at Shea Stadium. Not wanting to disappoint (and you really don't have to twist my arm to go to a Major League Baseball game - especially the Mets!!) I grabbed up some tickets from eBay and off we went! We started out on Saturday night instead of Sunday figuring a good nights sleep and half hour drive to the stadium would be better than getting up early and driving three hours. We stopped in Carbondale at the Red Robin for dinner, and then it was on to Paramus, New Jersey where we would be spending the night. Last year when we brought Mike down for a game at Yankee Stadium as well as the Devils game, we found a really nice Comfort Inn and Suites in Paramus (211 Route 17S, Paramus, NJ - room 216 - $144.89) to stay at. It's well located in relation to where we were going, and it's a nice hotel with a really good buffet breakfast to boot! Definately our favorite hotel in the area! We had a nice Mother's Day breakfast at the hotel, and then it was off to the stadium! With the new CitiField going up, we wanted to get there a bit early since a good part of the parking lot was now taken up by the Mets new stadium. We pulled into the parking lot right around 10:30 and were able to park two rows from the Jackie Robinson rotunda at new CitiField. Our seats for this game were on the third base side, Loge 19, row J. We sat here for most of the game, but in the later innings we were able to move down a few rows to get closer to the field. 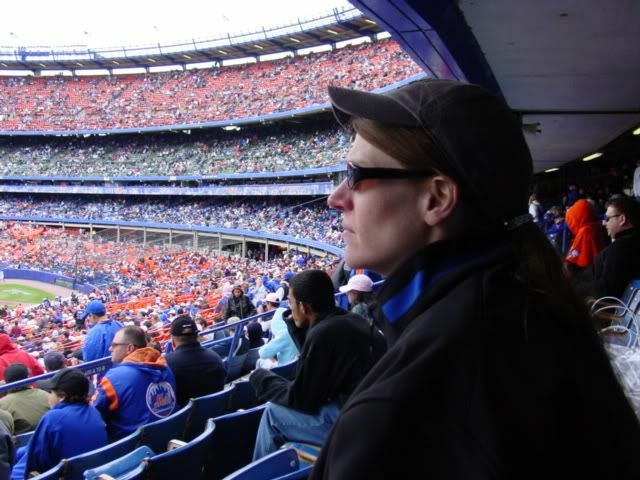 Even though it was a May day, it was pretty durn cold at the stadium with the wind swirling through Shea, so much so that Jill ended up going to the team store and buying a new Mets coat for us (yeah!) and a Mets sweatshirt for Mike! 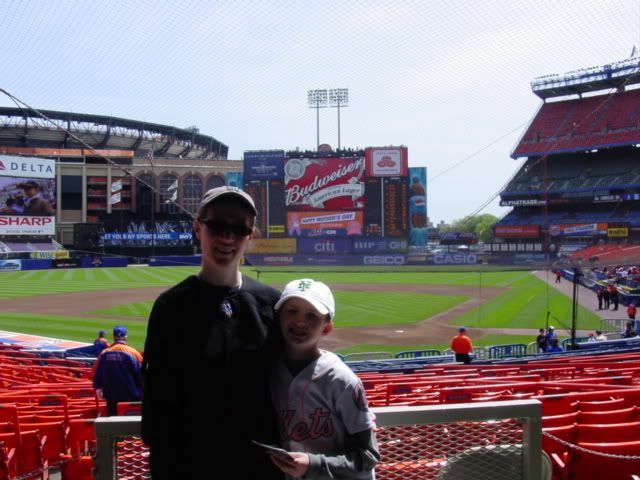 This would be the last trip for Mike to Shea Stadium (unless we found some free time before the end of the season!) 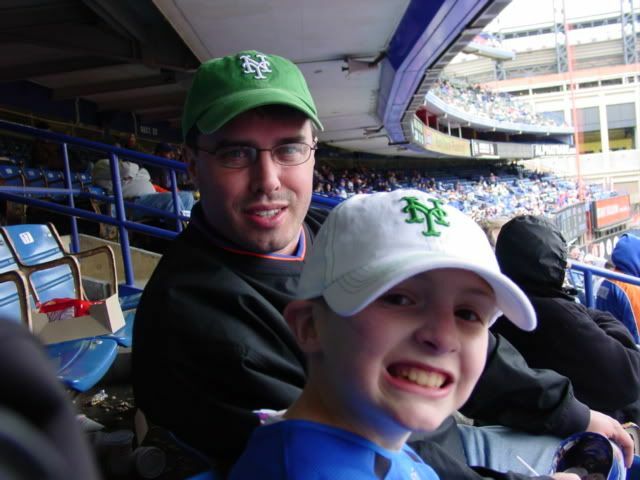 since the Mets are poised to move into CitiField at the beginning of the 2009 season. Jill and Michael in front of "New CitiField"
Jill watching the Mets take the "W" on Mothers Day! NEW YORK -- Only Billy Wagner can shush Billy Wagner. And only Billy Wagner did Sunday afternoon. He muzzled himself and let Oliver Perez do the talking. And Perez made his point, eloquently and, at the same time, wordlessly for five innings, which is all Wagner sought 11 days earlier, when he challenged his teammate to be more reliable and productive. "That's what I was looking for," Wagner said. "We all know it's there." Such was one aspect of the aftermath of the Mets' victory against the Reds on Sunday. Power and pink were in the middle of their batting order, Jose Reyes had another day of reawakening, the bullpen provided three scoreless innings and a ninth-inning alert that the Reds were out of order. Moreover, there was additional evidence -- it took the form of Mets 8, Reds 3 -- that Shea Stadium won't be nearly so visitor-friendly as it was last season. All that and Ollie, too. Perez's five stellar innings -- even if they came in a six-inning work day -- were a pick-us-up for a team whose starting pitcher has been less than expected for any number of reasons. For 20 batters, Perez was the pitcher who won 15 games last season. Then for six batters, he was the pitcher who had lost his three preceding starts, suffering 12 runs in 13 1/3 innings and then the slings and arrows of Wagner's candor and caring. In one game, Perez underscored his image as baseball's foremost pendulum-ic pitcher. Five innings that were Seaver-esque -- one hit, three walks, a hit batsman and eight strikeouts -- against a batting order that produced 29 hits in a doubleheader Saturday. Then he swung back to his Victor Zambrano ways and allowed three runs. By the time Perez had made the transformation, though, his colleagues had treated Reds starter Johnny Cueto harshly and done most of the damage necessary for the Mets' third lopsided victory in four games. They have outscored their opponents, 32-10, in the three games. Armed with pink bats to acknowledge Mother's Day and raise awareness of the fight for a cure for breast cancer, Carlos Beltran and Ryan Church had hit successive home runs against Cueto in the fifth inning to make a three-run lead twice as cushy. Whether it was the wider margin for error, the chill that invaded Shea Stadium, Perez's decidedly left-handed manner or, as the pitcher suggested, the after-effects of a West Coast trip and the day-night doubleheader, Perez (3-3) became noticeably less stingy. 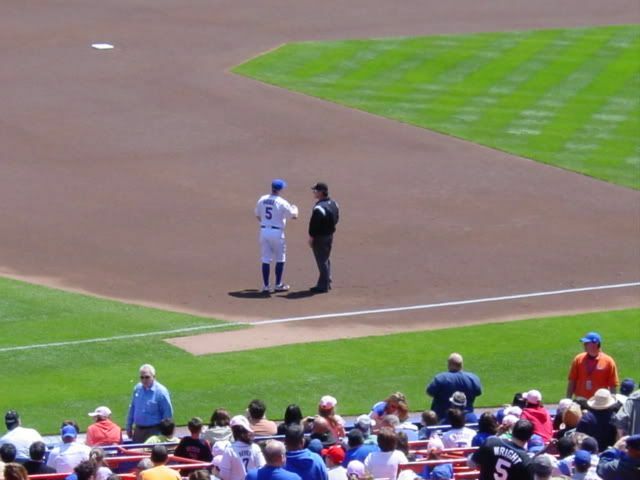 He said fatigue set in, even though he had one extra day off between starts and had thrown merely 7 2/3 innings since April 24. But he is left-handed, and, according to his manager, that explains almost any behavior or remarks inside or outside the box. Willie Randolph addressed his winning pitcher after the game and, smiling, inquired: "Ollie, how crazy are you?" Then, taking a cue from a reporter's question, Randolph asked, "Do you have a full deck?" "Playing solitaire till dawn with a deck of 51," came to mind. Randolph had prefaced the game saying he hoped he could keep Perez inside the box -- and on the mound -- repeatedly acknowledging the pitcher's free spirit and out-of-nowhere execution of pitches. He referred to Reds starter Bronson Arroyo, who shut down the Mets on Saturday with a variety of pitches, at various speeds from various arm slots. "The guy [Saturday] night can do that and still find his original arm slot," Randolph said. "Ollie can't. And sometimes he just wants be like the jazz player, improvising. He's a ballplayer playing in the sandlots. He has flare and style. Lefties are like that." As if to corroborate his manager's words, Perez threw several pitches taken from the Luis Tiant or El Duque playbook. One became a wild pitch with a runner on third base in the sixth. Perez's reasons for the alternative deliveries were: "I was trying to make outs" and "I was feeling good." Randolph noted some of them actually worked. Moreover, Perez does have a way with the Reds. He has a 9-3 record in 17 career starts against them. He has beaten no other opponent so often. As pleased as the Mets were, they also knew enough not to get too happy about five scoreless. They need only to look to recent entries in the Ollie Log -- no runs in his first 11 2/3 innings (two starts) this season, followed by six in 4 1/3 in his next start. "He can be inconsistent," Beltran said. And Manute Bol can be tall. "But he can be dominating" was the second segment of Beltran's sentence. And who could argue either? Perez's pendulum swings from one extreme to the other. And there's no way to tell when or why it will reverse. It makes him a bit of a phenomenon. His mates watch and marvel, sometimes laugh, sometimes grimace. After Perez's departure, they watched just as closely, so closely that Aaron Heilman noticed in the ninth inning that the Reds had batted out of order and notified the dugout. Randolph called the Reds on the infraction. Not that it mattered much. "No harm, no foul," the manager said. No loss, either. The Mets took the three-game series from the last-place Reds, and now have won eight of their past 11 games at Shea. They play four against the last-place Nationals and then three in Yankee Stadium, with Perez in line to start Friday night. Which Perez?